To this day many are skeptical that the attack was accidental and have even theorized that the attack was carried out to prevent the Liberty’s collected intelligence from being inadvertently picked up by the enemy. Three Israeli investigations blamed human error and poor communications from both sides on the attack. President Johnson accepted the Israeli explanation. William Dale was Deputy Chief of Mission in Tel Aviv during the attack. He was interviewed by Dr. Henry E. Mattox on September 19, 1988. Arnold Schifferdecker was a staff aide at the time; he was interviewed by C. Edward Dillery in 1996. You can read more about the Six-Day War. Q: There was a buildup to the war that lasted for weeks and then [Moshe Dayan] was appointed defense minister just before. Was that done deliberately? DALE: Yes. The United States had thought they had extracted a promise from the Israeli government that they wouldn’t go to war. 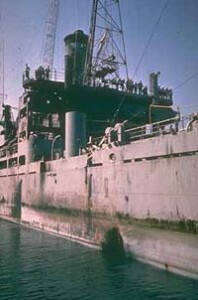 The Israelis did not consider they had made that promise, and they had no intention of putting off going to war within that period, because they didn’t think that our plan for what they called the Red Sea regatta, the international regatta, warships going up the Red Sea to test Nasser’s claim that he had closed it, the Straits of Tehran, was correct…. The Israelis didn’t think that would work, and they intended to go to war. Once they made up their minds they were going to, they called Dayan back as Minister of Defense. But once they’d done that, that was the signal they were going to war. The only question left was when Dayan would order it to begin…. Q: Did the ambassador feel betrayed in any way that the Israeli attack broke out, despite a supposed arrangement? DALE: No, but he did later before the war ended. His main contact was the American desk officer, Moshe Bitan. Moshe Bitan had told Wally Barbour that Israel realized there was a United Nations resolution for a cease-fire, and Israel intended to obey it, but he said they had “just a little matter” they wanted to clear up on the Syrian front. I was there. Now, the Syrians had not attacked in the Six-Day War, as you probably know. I think they fired a few shots and that’s all, not participating. But he said it would only take an hour or two and not to worry about it. So Barbour sent some kind of telegram to that effect. Instead of that, Israel moved all its troops from the Egyptian front who weren’t involved, and the central front, because they were beating the dickens out of Jordan by this time, up to the northern front. The Golani brigade went up to Golan Heights and led a major attack, which was not what Bitan had said. This was also the time of Liberty, which may very well have been attacked for the same reason, [since] they didn’t want us to hear all the orders that were necessary to transfer thousands of men. I don’t know that; that’s speculation on my part…. Later on, the Ambassador got a hold of Bitan and said, “You deceived me.” He was, for him, quite angry. He was always very careful, because he always had President Johnson looking over his shoulder, so he never got really angry. But he was as angry as he ever got. Q: When did you find out about the Liberty? So Ernie got his lunch, which he had brought to the office — we were more or less living in the office — and put in a note, “Do you want any help?” And flew over the Liberty, which was sort of listing out there. I’m not sure it was listing; it was almost unguided in the water, smoking like everything. He dropped it on the deck from the helicopter. The personnel of the Liberty waved him away. 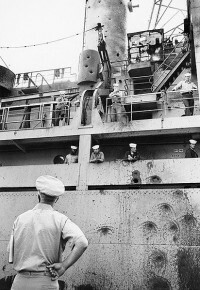 So Ernie came back a little disconsolate, and said, “They need help like everything, but they won’t take it from the Israelis.” He didn’t realize, nor did the Israelis tell us at the time, that there was a big American flag on that ship. So we didn’t know that, and we thought it was a genuine error. Q: Did Barbour ever become irate about that? DALE: No. If he did, he didn’t show it. He had to be very careful not to show emotion like that which might set the staff, you see, thinking things. So he was very, very quiet about what personal thoughts he might have had. From that time on, though, he was very much more pro-Israeli, from the time of the Six-Day War on. DALE: I don’t know. He was deceived, they fooled him, the Liberty was not an accident, and he must have known it. Well, he put it this way to me once. He said, “You know, Bill, Israel’s relations with the United States is the way of the future. I don’t care if the Arabs have all the oil reserves in the world. Our relationship is going to be with Israel, and I’m going to promote it.” This was shortly after the Six-Day War. That’s all he ever said. I think he saw the strength of the bond between Israel and the United States, which became clear about that time. We did send an awful lot of war material towards the end of that war. SCHIFFERDECKER: Occasionally I was given special assignments by the ambassador to go to the Foreign Ministry. Basically it was delivering things which he had promised Abba Eban or the head of the Israeli MFA’s American Section in Jerusalem. Of course, with the embassy in Tel Aviv and the Foreign Ministry in Jerusalem, it involved a trip of about 45 minutes to an hour each way. One of the demarches I delivered was a demand for financial restitution after the Six-Day War. You may recall that during that war there was a bombing of an American ship, the USS Liberty, a communications ship, manned by the National Security Agency. A number of Americans were killed and wounded in that attack. Israel claimed it had been a mistake, they said they had thought it was an Arab ship. Some people later said the Israelis knew exactly who they were bombing, i.e., they didn’t want us monitoring what they were doing. But, in any case, we were called after the attack by Israeli Defense Minister Dayan to come to the aid of that ship, saying that the ship had been disabled and there were probably casualties on board. They flew our military attaché out by helicopter to communicate with the ship. This communication was by flashing light as it was night and because the bombing had knocked out all of the electronics. So, we found out that there were around several dozen Americans killed or wounded in that attack. Somewhat later I presented to the Foreign Ministry a bill for the damages suffered by the ship and indemnity for the families who had lost loved ones. The total, I believe, was around ten million dollars. That was presented to the American Section in the Foreign Ministry. The recipient, an Israeli named Shlomo Argov (later Ambassador to Mexico and the UK), said that he would refer the matter to the highest levels in government and eventually, I understand, compensation was paid. Q: It was interesting being the person who was the messenger in that case, I am sure there was a lot of tension. I do remember that there was a lot of tension about that case. During that period were there any special meetings or events between the United States and Israel, prior, during or after the war? SCHIFFERDECKER: There certainly were a lot of consultations. The Israelis did not tell us ahead of time they were going to attack. They claimed they were acting in self-defense and a case could be made that an attack by the other side would have left them crippled and maybe unable to do what they did, which was to destroy the Egyptian, Syrian and Jordanian air forces on the ground before they were able to attack Jerusalem and Tel Aviv. President Johnson was livid about not being consulted and demanded an explanation, which Ambassador Barbour obtained from Prime Minister Eshkol. Basically, the explanation was Israel could not afford to wait to be attacked; by then it would be too late to defend themselves. Shortly after the onset of the Six-Day War a White House emissary came from President Johnson. He spent some time in the embassy getting in touch with the Israelis and coordinating with the defense establishment on the re-supply of ammunition and other armaments that Israel expended in the war. There were a lot of postmortems conducted and delegations came to us and Israelis traveled to the United States. The most immediate action came up in the Security Council. Abba Eban, the Foreign Minister, flew to New York and the famous UN Security Council Resolution 242 was negotiated with our help and 242 continues to be one of the basic documents undergirding today’s peace process. One of its main provisions, the inadmissibility of territorial gain by conquest, has helped to constrain Israeli expansionists and to keep the Arabs at the negotiating table.